Providing durable, precise measurement for a variety of challenging target applications, the Banner LTF sensor offers solutions where other sensors fall short. 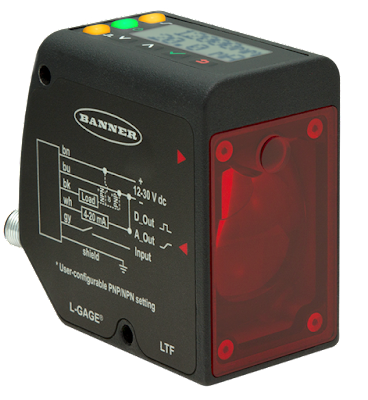 The LTF sensor uses time-of-flight measurement, emitting a pulsed light, measuring the amount of time for the light to reflect off the object and return to the sensor to calculate the distance. This enables sensing in long-range applications across a wide variety of targets. With high excess gain, high reliability, and ease-of-use, the LTF provides best-in-class performance. Dynamically adjusted laser power increases output for dark targets or objects at steep angles, while reducing power for shiny targets, providing accurate measurements across a wide range of challenging applications. The LTF sensor offers easy setup without a manual, quick monitoring and troubleshooting, and no learning curve when transitioning between products. Join C&E for a webinar highlighting the Banner LTF. CLICK HERE for registration. For questions or more information, please call 1-800-228-2790. Thank you!